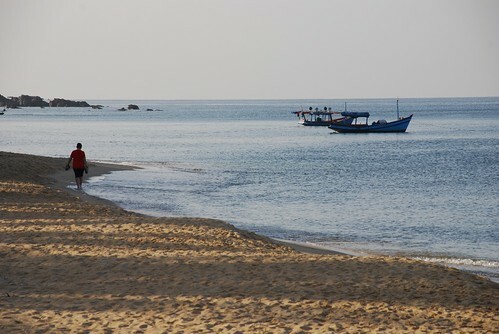 Phu Quoc is a really hot place for people who need a relaxing time on a beach which is still wild, quiet and peaceful. 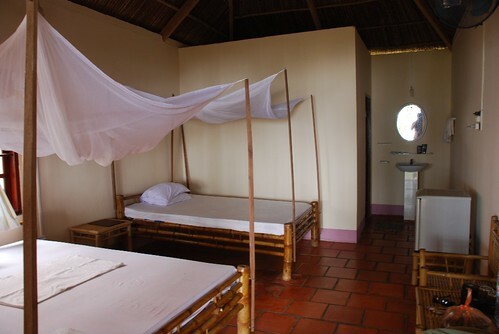 Phu Quoc people are generally friendly, sweet and helpful. The small town on the island is very interesting, surrounded by the ocean and people here rely on fishing and tourism for their daily income. Even though they all know that their small beach town is a great destination, everything seems very cheap here compared to other beach cities in Viet Nam which is good. However, it's hard to get a good room here without making a reservation at least three weeks in advance as I did. I was so lucky to get the only room left on my arrival. You may get a cheap and doggy room for about $12 to $15. 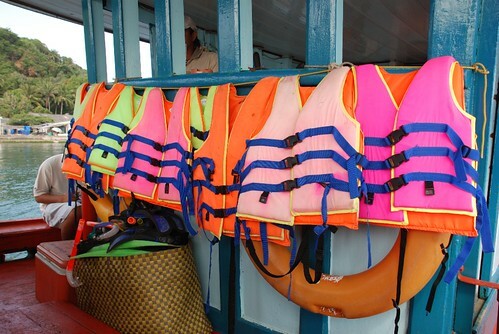 In Phu Quoc, a variety of tours also can fill your schedule up: daily boat trip, squid fishing in the evening or visiting the north and south of Phu Quoc in a full day trip. If you don't choose the beaches near your hotel in the town, there are some more remote beaches that are incredibly beautiful. It might be just you alone on the whole beach. Paradise! 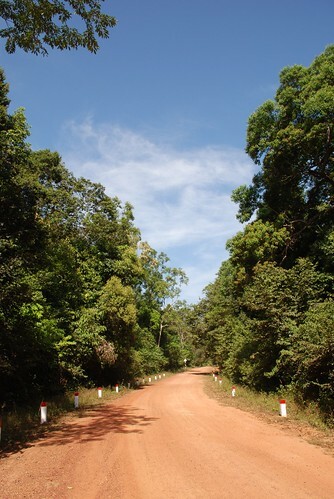 Along the main road leading to the south of Phu Quoc, there are many joint-ventures and local companies investing in big and high class resorts, also an international airport. It seems to be one of those situations where development is necessary but I hope it doesn't ruin the simple atmosphere of the island. It's annoying getting covred in dust on the roads here but I suppose you can just dive into the water at the beach to wash it off! Anyway, Phu Quoc is still a beautiful place and worth staying for a few weeks just to relax. For the next couple of years, even though the development is fast, it will be possible to have a great holiday here. My friend's sister has just opened a small clothes shop at 49 Hang Bac street called Son Hai Silk in the old quarter. She was really busy yesterday and she asked me to take care of her shop for a few hours in the afternoon. I went there to help her and in the three hours at the shop, I saw so many frustrating things happen. First of all there was a big fight between two young guys and two old men due to a motorbike accident. These young boys attacked the men who of course fought back causing one of the young boys to run away. The other one shouted at big time but the people around let him go. These boys thought they could knock these men down but they were wrong. Idiots of the day!! Secondly I saw lots of Vietnamese customers walk in and try clothes and check out the materials and price and comment about my friend's shop. I recognized that they are from other shops around who wanted to come and look at the new shop and of course they didn't buy anything. The third weird thing was a couple near the shop had a fight with each other with all really rude swear words but this is just so common in Hanoi. They are just as famous for swearing as they are for singing a song. In only three hours I had seen many funny and weird things happen but I couldn't help my friend sell a thing. I will come back another day with a DVD to watch or a book to read. But if I have this kind of entertainment next time, I won't need to! For someone like me who doesn't really know anything about pagoda culture, including the services offered, my recent trips have been interesting. All kinds of special services exist, such as money changers, incense sellers and lighters, fake money vendors, florists, wish list writers, relax mattress providers, toilets, hot showers, porters, and so on. 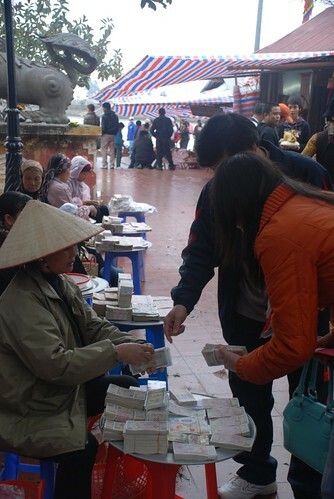 I saw so many people exchanging money around the Perfume Pagoda it was like a bank. 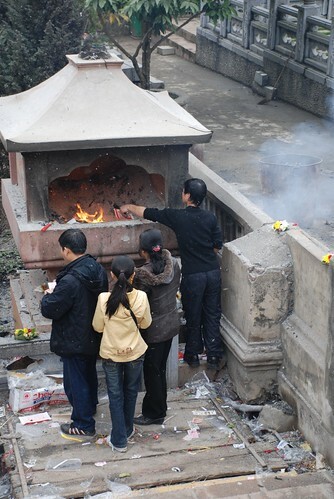 Everyone going to pagodas needs small money to put on altars and on the food trays, and also to give away to beggars for luck. If you want to change 100,000 dong, it will cost you 10-20,000 dong. That's the rule and everyone observes it. Lots of other services exist on the way up the hill, including souvenir shops and small restaurants where you can sit down and eat your own picnic food. 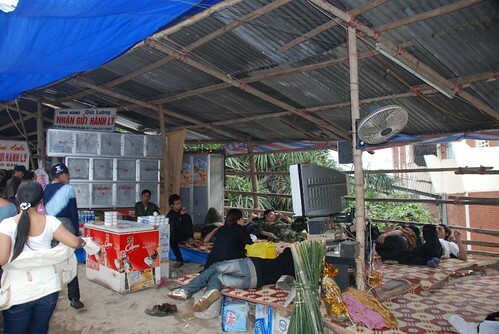 They charge 10,000 dong for one mattress which can handle five people, and if you want to borrow a knife or glasses, they may charge some more for that. There are many CD shop around and unfortunately, they don't play meditation or religious music. They play horrible crap pop music so loud which is really annoying. Everything you purchase needs to be agreed on in price in advance to avoid getting ripped off when you ask for the bill. Lots of these people assume that everyone who comes from the city is rich! But on the other hand, these people really only have a chance to earn money in the first few lunar months during the pagoda festivals. Photographers also offer a service and there are heaps of them around. They ask every single person if they want their photo taken as a souvenir except me. They hate people who bring their own cameras! It is usually an express service and the photos can be ready in an hour but they are quite expensive. 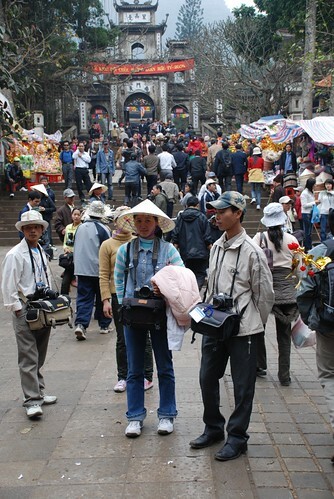 Many Vietnamese people nowadays have their own digital cameras but some of them still want a professional photographer to take a good one to show their friends. I heard one group of people arguing with one of the photographers about the quality and refusing to pay. The third service is a vital one during the trip: the toilet part. It really makes me angry that they are really bad, stinky and dirty toilets at some of these pagodas because you have to pay to go. Some places charge 1000 dong and others charge 2000 dong and if you have to do number 2 then you may pay more for paper:). I always save doing number 2 until I get back to Hanoi as toilets here don't have doors and you have to hold your breath. They also sell hot water for showers as well and I'm not sure if it's clean water but I didn't see many people taking showers here. I didn't ask the price for this but I don't think it would be cheap. The best part of my trip was my conversation with Huyen, a porter who's 32 years old with three kids. She's from My Duc, Ha Tay. She comes here to offer people to carry their stuff up the hill to the cave pagoda. 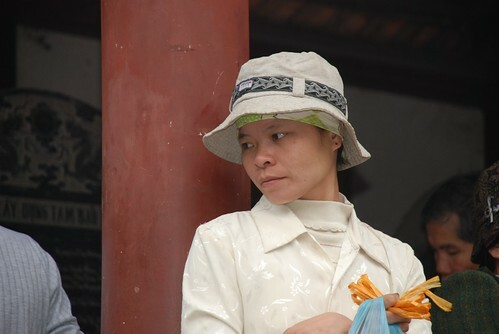 She said that some days she earns about 200,000 dong and some days she earns nothing because there are lots of people around doing the same job and the competition is tough. She's such a nice lady. She also said that she only does this during the festival as her main job is working on the rice farm. This is a good chance to earn some extra money for her kids for schooling and also save a little bit for the family. It was really nice talking to her and I feel bad that we didn't have any way to help her out but I gave her 20,000 dong so she could buy something to drink. 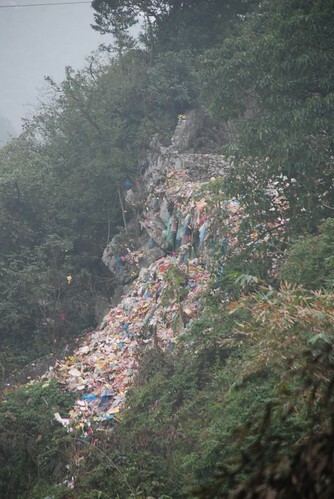 Finally, I think the government should do something about the environment here as I saw people throwing rubbish all around, in the river and on the side of the hill. Visitors are destroying this beautiful place every single day even though there are many signs around but it doesn't seem to mean anything. Please keep the place as clean as it should be as this is such a holy place which attracts so much tourists, and also give hundreds of jobs for the local people. My friends Anne, Arno and I joined a boat trip visiting 12 islands around Phu Quoc to swim, snorkel and sunbathe. The second stop was the most impressive place during the trip as we stopped at a really beautiful white sand beach, which looked like a private beach, not too big and very clean. There were so many beautiful fish and so much coral around and the water is crystal clear and I felt so fresh. 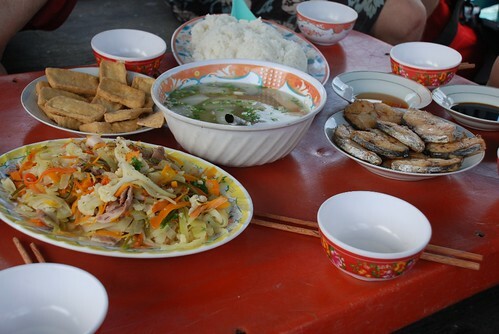 We had lunch on the boat and the food was fine and included deep fried tofu, stir fried mixed vegetables with beef and squid and vegetable broth. They also gave us some fresh fruit such as pineapple and watermelon for dessert. The last stop of the trip was Sao(star) beach and we travelled there by bus, not by boat and I don't really know why, perhaps to save money. The trip only cost $15 for the whole day. Anyway, this is one of the most popular and best beaches in Phu Quoc but it was also full of tourists. On the way back to town we were laughing heaps as the driver kept using his horn and tourists in the group keep asking him why this happens in Vietnam and not in their countries. He said he needs to use the horn because there are many cows, chickens and dogs wandering in the middle of the road and of course there are hundreds of people driving the same time as us but by motorbike as well. We had such a good fun day and thanks to my friends and the tour for such great company. There is a variety of food in Nha Trang but seafood is most people's first choice as Nha Trang is a coastal city. I was really surprised about how many restaurants have opened in the last 6 months. There must be hundreds of them. Now almost every corner of the city seems to have one small shop or restaurant. Eating freshly cooked seafood on the beach is something special in Nha Trang. There are lots of vendors selling seafood on the beach . They generally buy their fresh seafood in the morning and start their business at 11am the same day. In the afternoon, there are also lots of seafood stalls along the main street, Tran Phu Street. 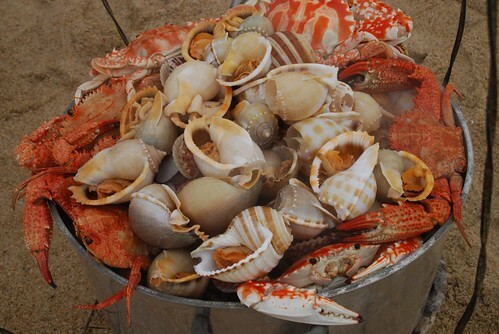 They have lots of fresh lobster, big sea crabs, squid and many other seasnails and clams. I tried the food there once and absolutely fell in love with it. It wasn't expensive at all especially compared to Hanoi or Ha Long Bay. 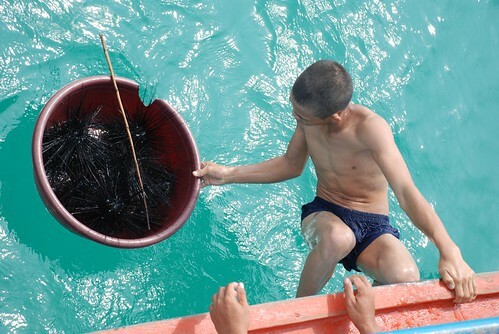 Besides the seafood, other local specialties are also very famous. 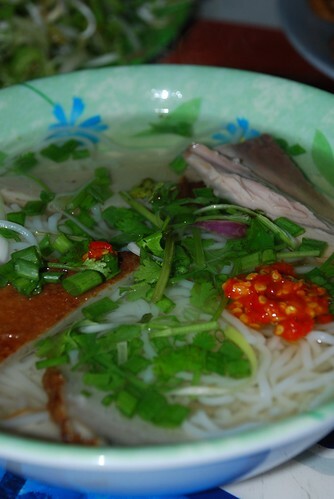 Spring rolls, chicken noodles and the most famous noodle soup with fish. I think in Nha Trang, whatever the locals cook that is related to seafood gives the city its reputation. Most Ho Chi Minh City residents who come to Nha Trang visit Nam Beo restaurant. The owner started her business over 10 years ago in a very tiny house but it was really good and the business has grown quickly. Her soup is still very good but don't go there early in the day especially during festivals because you have to wait for such a long time or stand right next to her for your self service. I was there during Tet and I was stuck there for half an hour and I was shouting at them to prepare my noodles. But actually, there were too many people and she only has a few staff to help her. Anyway, I love going back there to get a real fish noodle soup with fish cakes. 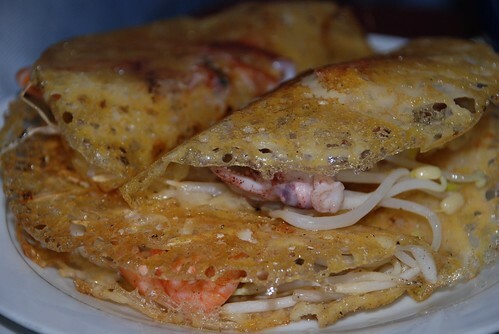 Banh Xeo-steamed rice pancakes with seafood is such a delicious dish cooked with prawns, squid and with egg if you like. Everyone knows Banh Xeo Mien Trung in Hong Bang Street as it is the most famous place for this dish in Nha Trang. This shop also has been open over 10 years and still doing really well. The difference between Banh Xeo in Nha Trang and other parts of Viet Nam is the cake is round but small with seafood, beanshoots and quite crispy. The dipping sauce is very simple with some chilli, pineapple, sugar, lemon, fish sauce and some water mixed up. They will serve you the pancakes with a big plate of fresh vegetables including different herbs, salad and some bitter veggies. It's my favourite dish!!! Finally, we arrived at Thien Tru Temple( God's Kitchen). 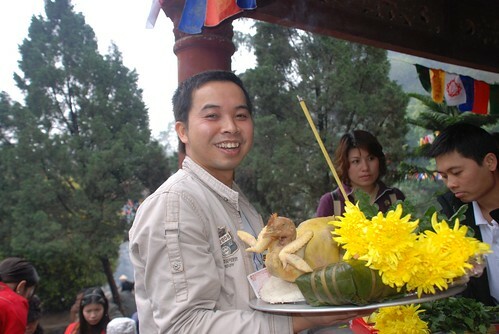 The rules of Thien Tru Temple don't allow visitors to put meat on the offerings tray and my friends had to remove the huge chicken and replace it with some more beers, cokes, square cake, flowers, sticky rice, money some fresh fruit and and lighted incense. 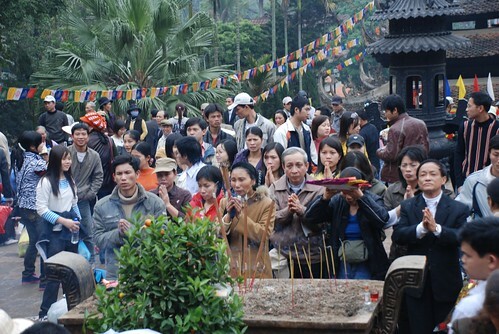 This is such a busy destination as most people come here before heading to the top of the hill then down to Huong Tich Cave. Devotees spend billions of dong here at this festival in the form of fake money, and fake holy stuff which is then burnt in giant incinerators after 15 minutes of praying and offering. People satnd in queues just to burn these papers and the ash flys around in the air, into everyone's hair like a volcano has just erupted. This is a tradition that should remain but people shouldn't burn so much in the hope that they will get the same in return. It's all very superstitious. I only spent about 300,000 dong on the whole trip including food, drink and transportation but many people spent millions of dong for the same thing but with the burning of the fake papers. Khai, my friend, had to bring the tray inside and the rest of us took a rest to take photos around the complex. I tried to get inside to take some photos and give a wish but I couldn't as too many people were praying and reading their wish lists at that time. We left the Kitchen God's temple for Huong Tich Cave which took us about an hour. It was a pleasant climbing trip as we could see the scenery around and also hear the crazy music and look at the souvenir shops along the way. 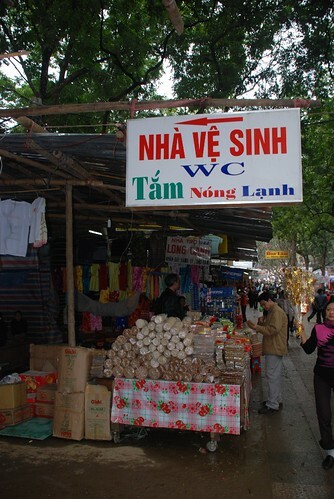 People were selling all kinds of goods, from sugarcane juice to toilet services. The toilet service is popular and you can imagine what the experience was like with all those people on the mountain!!! We decided to stop for lunch on the way up at one of the relaxing areas which had mattresses. We laid out all of the food which had been offered to the gods and tried to finish it all. Some of my friends felt a bit drunk after a few beers. We ate two big chickens, two square cakes, lots of fresh fruit, pork rolls and two plates of sticky rice. I felt sleepy after all but we had to finish our trip up. Eventually we arrived at Huong Tich Cave and my friends repeated the same procedure with the tray and more food! This time our tray was topped with a special fake money tree. 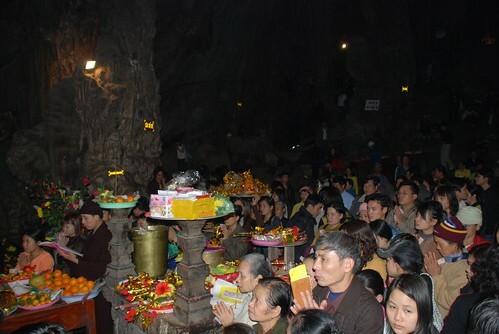 Hoang, one of the boys on the trip took them deep inside the cave which has the main altars of the whole complex. 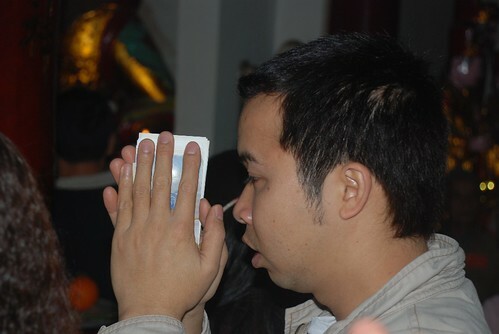 We had to be really aggressive to get close to the alters to pray. This is a huge cave packed with people inside praying at the same time. Most people touched the rock called 'the golden tree' wishing for a lucky year. They also stood around waiting for water drops to drip on their hands in another place called mother's breast for the same reason. Thanks to Khai and his friends for inviting on this journey and, even though I'm not a very religious person, I really enjoyed the cultural experience and hope that everyone who believes gets what they prayed for!